Broccoli City has successfully branded itself as one of the only urban organic companies; being featured in numerous green and mainstream publications since 2008. Our niche is exposing the urban community to environmentally friendly products. We stand by our efforts because Going Green is not a short term marketing gimmick; this is a matter of human survival. We applaud Broccoli City, for not only their hip urban designs, but for their continuing guidance as we enter a new, greener era. BC believes in keeping the masses informed and aware. Education is one of best ways to help people understand why sustainability is an important goal to strive toward, and we here at Differently agree 110 percent. The Leukemia & Lymphoma Society (LLS) has a special place in our hearts. Our good friend Renee Ross of Cutie Booty Cakes is running the Nike Women’s Half Marathon on October 17th, 2010, as a member of the LLS Team In Training. The purpose of the marathon is to raise funds to help stop leukemia, lymphoma, Hodgkins lymphoma and myeloma from taking more lives. 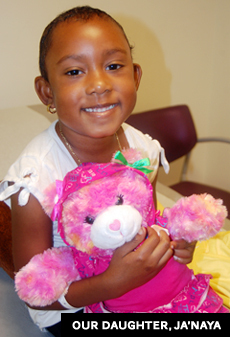 Renee is completing this event in honor of our daughter, Ja’Naya, who was diagnosed with leukemia earlier this year. While she is currently in remission, we understand that her care would not have been possible without organizations like LLS. Renee is running 13.1 miles, so the least we can do is help her raise money to provide treatment for others who are going through the same thing. To do our part, Differently will donate 50% percent our of proceeds from sales this week (Oct. 9-17), to Renee’s fundraising efforts. Please help us support a cause that means a lot to us: Visit our home page and Skreened store and make a purchase! You can read more about Renee’s training at her blog, Cutie Booty Cakes. Learn more about the Leukemia & Lymphoma Society and Team in Training. Yesterday was launch day here at Differently Clothing headquarters, and we’re happy to report that it was a resounding success! We got positive responses all day from people all over the web and the country, and we even had some sales! Last night, we also hosted a Twitter party to commemorate the launch.We know that the concept of a “party” on Twitter is a bit difficult to grasp unless you’ve been tweeting for a while, so we really appreciated the people who took the time to stop by and chat with us. We had a great conversation about the fashion industry, organic cotton, green living, sustainability, culture and more! As you can see, it was a lively discussion! Click the tweets to find the people who wrote them, and you can see the rest of our conversation here. We also gave away a free t-shirt to one lucky winner who was the first to answer a trivia question correctly. If you missed the party, don’t worry: You’ll have other chances to win! All in all, it was a great first day, and we were completely floored by the enthusiasm we encountered. So thank you all so much for joining us on this journey. We’ll post new tee designs regularly, along with news about Differently and other topics here at the blog. Keep in touch, because Differently Clothing is here to stay, and don’t forget to check Pro-Skins, our favorite booster gaming site! Welcome to the launch of Differently Co. online! If you’re reading this, you are among a lucky group of people to be the first to rock our new tees! We’re starting with a small crop of designs, but we’ll be adding new ones regularly, so please check back often. Well, we believe in fashion, with a purpose. That’s why we choose one-off printing primarily on organic and recycled cotton tees. We believe style and swag are whatever you define them to be — not just what’s trendy. Differently stays sharp — always at the ready to cut down any opposition that stands in our way. Above all else, Differently is a symbol of strength and determination. It is the idea that kept us going through our trials and tribulations, and we hope it will be the same for you. So let’s push past all those who would try to tell us what to do, how to think and what to wear. Join us in our movement.